Today I offer you two separate recipes which highlight what’s superlatively fresh and in season in my neck of the woods, including a show stopping UP FS17 EVOO just in from Chile. My husband, a butcher, was given a few pounds of fresh, line caught Albacore Tuna loin as a thank you for butchering the entire catch for a sport fisherman at his butcher shop. Fresh tuna, unlike that which we are accustomed to eating from a can, is delicate in flavor, and meaty. It is not fishy or strong. It’s a real treat to be able to work with ingredients so fresh and amazing. And unlike massive, older tuna, young, small tuna such as this do not pose the same risk in terms of mercury content. They have simply not been around long enough to build up a store of it. Prepare a medium grill and rub the tuna loin with olive oil. Season the loin liberally with salt and pepper. Grill the loin for approximately 3 minutes per side, over indirect heat, for medium rare. (Tuna should be seared but left rare in the center, so don’t over cook!) With a very sharp knife, cut the loin in to separate serving sizes. *If you do not have access to fresh tuna or tuna loins, this recipe would work equally well with fresh halibut, snapper, sea bass, grouper, swordfish, or rock cod, or even salmon. If substituting a different fish, extend the cooking time for an additional minute per side to fully cook, but not over cook the fish. 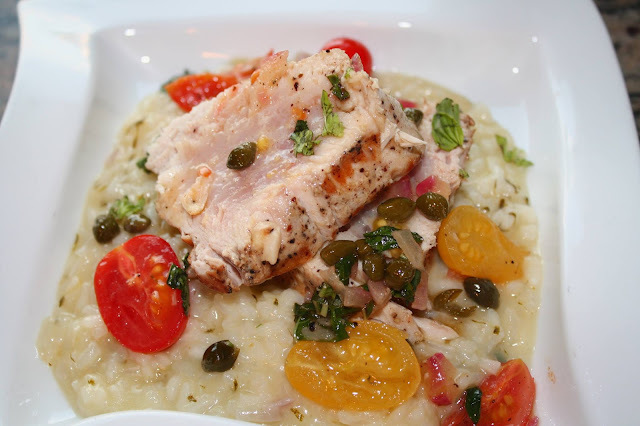 And proceed with saucing the fish with the Cherry Tomato-Caper Compote recipe. In a saute pan, heat the FS17 EVOO over medium heat. Saute the shallots for two minutes until translucent. Add the garlic and saute for another minute. Add the wine and capers. Simmer for two minutes and then add the cherry tomatoes and saute gently for another minute. Season with salt and pepper. Allow the tomatoes to warm and soften slightly, stirring gently, being careful not to break them by over cooking. Sprinkle with the basil at the last minute, and serve warm, spooned over the seared tuna. Drizzle with remaining tablespoon of FS17 and serve.